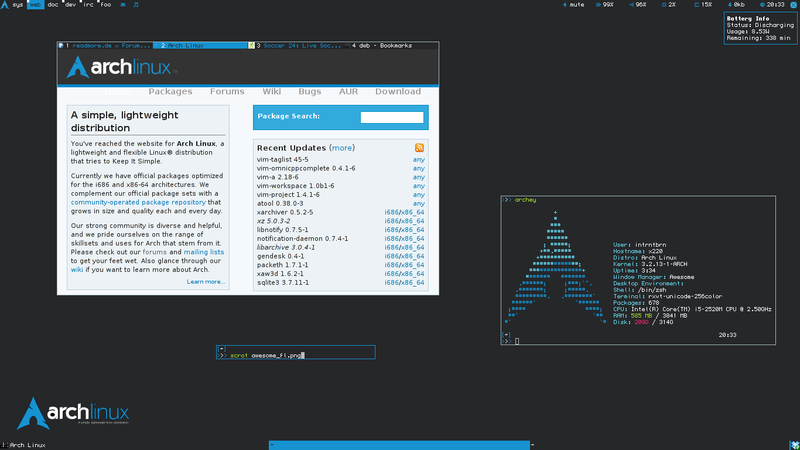 » Share your Awesome(WM) desktop! Re: Share your Awesome(WM) desktop! They are not icons, they are characters from Termsyn.Icons Honestly i don't know too how to set icons in tags...is there anyone who knows? then how did you set that up?can you share your rc.lua please? They resize automatically to the bar size...do you know how to fix? I'm a Paladin with 18 charisma and 97 hit points. I can use my helm of disintegration and do one D4 damage as my half-elf mage wields his plus-five holy avenger. Regrettably I do not. I had the same issue when I tried to add the color switch to the convert and re-size. I've been meaning to look into it but just haven't done so. Apologies, but if you get it figured out I'd love to know as well. So you used standard icons without color? @TheImmortalPhoenix, what are you using for shadows? I did and they just happened to turn blueish... Probably user error on my part, but thank you for the fix. I'm doing it now. 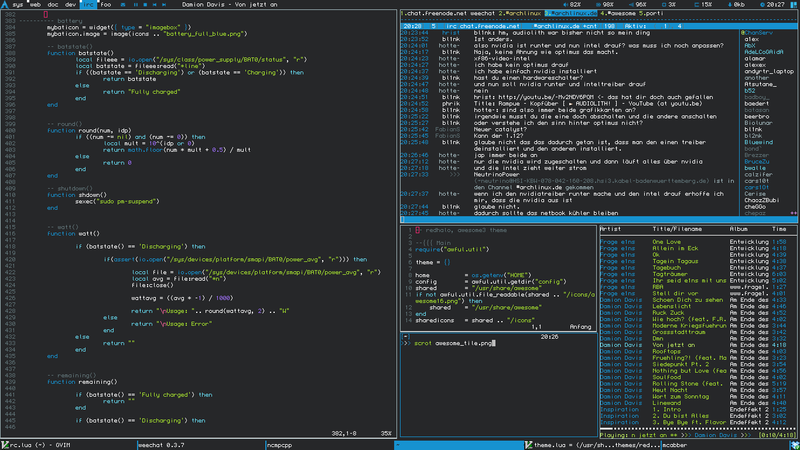 Can you share terminal colorscheme? Does anyone know if it's possible to create a padding in menu? Does anyone know how to fix youtube fullscreen problem? When i switch to fullscreen i still can see bottom bar...tried mod + f but nothing. I trying to use gmail widgit but i don't know where to put username/password for gmail...do you know how that stuff works? Your desktop is really beafutiful. That's for font characters, what he meant was REAL icons.